Great post from Wilmington’s Cow over on Blipfoto just now about how depressingly far we are from being a “model” cycling city here in Edinburgh. So, the junction is closed for redesign, so far so normal. Except, on this busy crossing, while they put in place big yellow ‘diversion’ signs for those in cars… Pedestrians and cyclists, the people for whom this is being redesigned, have the crossing switched off, and…. Nothing. No temporary crossing, just… Nothing. On one of the busiest roads in the city…. Nothing. The fact that it took various people on a cycling forum to complain before even a temporary crossing was put in is frankly laughable. That they put it in then don’t provide any signs that it is in use (because it’s in a different location) is just ridiculous. To be fair, I suppose we might be an exemplary model of how to have a noisy, fume-filled, car-centric cycling city, but I somehow doubt that was the original intent! It’s frankly rediculous that Middle Meadow Walk has been cut off with no provision for the crowds of cyclists and pedestrians to get over speeding Melville Road. For those not familiar with the area, Middle Meadow Walk is a major thoroughfare connecting central Edinburgh with Marchmont and the south side, including several schools and the Sick Kids hospital. People are crossing anyway, of course, but dicing with death to do so. All for the want of a simple temporary crossing! The majestic irony of this whole situation is that the works are only in place to improve the junction for active travel, as it has a terrible layout for cyclists and pedestrians anyway. Update: after councillors were badgered repeatedly by concerned citizens, a temporary crossing has finally been put in place… but further down the road with no diversion signs. This really begs the question: who in Edinburgh Council just doesn’t get it? 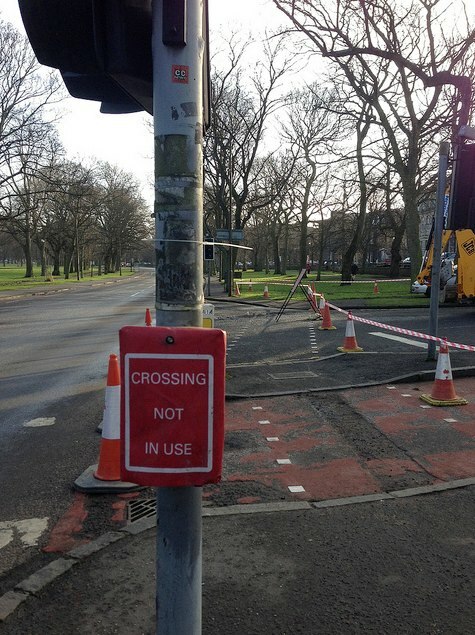 If someone was knocked down trying to cross Melville Drive would they take responsibility? After all, the alternatives are some distance away, and the park is big and dark. People aren’t just going to abort their journey because there’s a ‘crossing not in use’ sign up, especially if they’re trying to get to school or the Sick Kids. For once you have to feel a bit of sympathy for the city’s councillors here. They can’t be expected to personally supervise every piece of works, yet they are ultimately responsible for the public’s wellbeing. MMW is the ‘flagship’ route for cyclists. In fact I reckon without the normally reliable path of MMW operating a lot of people wouldn’t bother cycling. So if we can’t keep the best and most popular routes working safely – then what can we do.